Gold Hill Dentistry is committed to providing patients of all ages in Fort Mill the most personalized general, cosmetic, and restorative dental care. Dr. Kavi Sagunarthy and Dr. Jennifer Mokris focus on the health of each patient on an individual basis, yet with family dentistry they are also able to take into account the health of all family members. Gold Hill Dentistry offers both children and adults comprehensive family dental care by using the latest state of the art dental technology in an atmosphere that is relaxing and comfortable. Whether you and your children have excellent dental health and simply need routine preventive maintenance or your smile needs restorative care, Gold Hill Dentistry is the dental practice your family can trust in South Charlotte to achieve a healthy, long lasting smile. There are many benefits to having a dentist for the whole family. One major benefit is that of convenience for everyone. Most of the time, appointments for multiple family members can be scheduled on the same day with back-to-back appointments. This saves parents from having to drive all over town chauffeuring children from one appointment to the next. 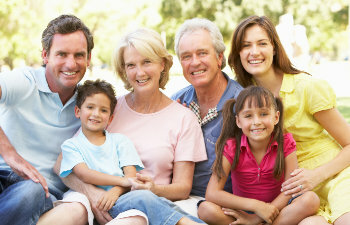 Another major benefit for every member of a family seeing one dentist is the knowledge that your dentist learns about the family’s dental history. If parents have an issue that makes them prone to cavities or gum disease, then the likelihood that their children will also carry these same propensities is very high. Treating multiple family members allows dentists a comprehensive knowledge of everyone in the family, and it enables your dentist to provide the best care to every family member. Everyone deserves a healthy and beautiful smile. If you are looking for a qualified dentist for the whole family, please contact Gold Hill Dentistry today. Our entire staff understands the importance of treating all patients with respect, dignity, and concern. We look forward to serving all of your family members to ensure that you all have a smile to be proud of for years and years.